Green hotels: It’s easy being green! 1. Rethink your flow: Installing low flow systems—toilets, sinks, and showers—in every bathroom not only lessens the amount of water used by guests, but it also lowers the monthly water bill that the operators have to pay. 2. Buy local: Consider buying organic and locally grown produce for kitchens and restaurants. This not only lowers gas emissions for transportation, but it supports local farmers and sellers. Plus organic foods stop pesticides from polluting the environment. 3. Offer incentives: Busy travelers don’t always remember to decline room cleaning or towel changes. Jog their memory with a well-planned incentive program. Offer five dollar gift cards to Starbucks or money off a meal at the hotel restaurant. This will be sure to entice distracted travels to participate in your hotel’s green programs. 4. 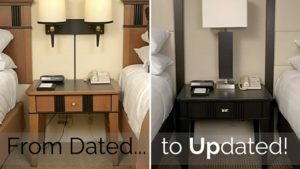 Asset Management: Hotel furniture sees a lot of use, but sometimes all it needs to look and perform like new again is a new finish or new upholstery. Instead of buying new furniture consider refinishing and refurbishing instead. Not only does it save time and money, but it prevents tons of wood from ending up in landfills. While there are many other ways for hotels to save money and the environment, these few tips not only help save money, but it reduces carbon emissions and environmental impact otherwise produced by manufacturing new pieces of furniture and throwing out the old. In the end, having a green hotel not only appeals to the interest of the consumer, but it helps to maintain budgets. A win-win all around!